Not only was Wilderness Park filled with people yesterday afternoon, it was also filled (as usual) with birds. This is a pair of of rock doves (also known as rock pigeons). I know, you see them everywhere. 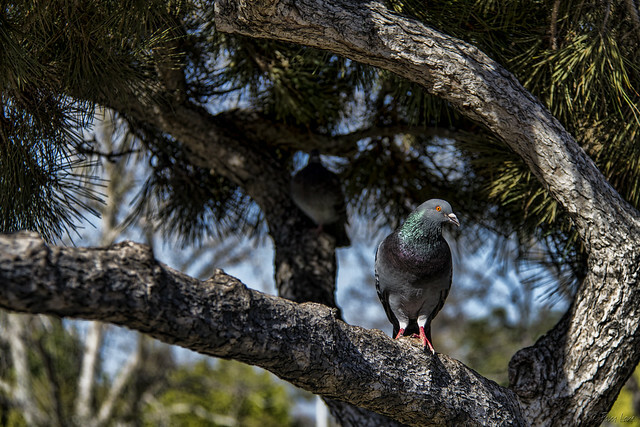 Pigeons are so common in parks and public places that they are sometimes considered a scourge to public health. (They have been called "rats with feathers.") And feeding them is nearly always discouraged. But they're not all bad. Rock pigeons carried messages for the U.S. Army Signal Corps during World War I and II, saving lives and providing vital strategic information (http://www.allaboutbirds.org). And did you know that pigeons mate for life? I had fun watching this happy couple.